(PRC, Hong Kong, 16 April 2014) United Photovoltaics Group Limited (“United PV” or “the Company,” stock code: 00686.HK, whose largest shareholder is China Merchants New Energy Group “CMNE”), a leading solar power plant investor and operator in China, today announced it entered into a strategic cooperation agreement (the “Agreement”) with China Financial Leasing Company Limited (“Sinolease”, www.sinolease.com). 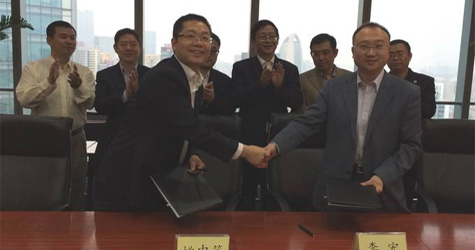 Sinolease intends to provide United PV with finance lease in an aggregate amount of no less than RMB10 billion. Pursuant to the Agreement, the finance lease provided by Sinolease is mainly to support the Company’s acquisitions, development and construction of solar photovoltaic power plants at home and abroad, as well as the cooperation between the parties in the areas of operation and maintenance of solar photovoltaic power plants during the five-year period. The leasing solutions include but are not limited to direct lease, sale-leaseback, leverage lease, entrust lease, etc. Moreover, Sinolease also intends to provide financial consultation service to the Company and develop financial products and services for the specific business needs of the Company. Sinolease is a finance leasing company jointly founded by Tianjing Innovative Finance Investment Co., Ltd and Sino Finance International Co. Ltd with RMB2 billion of registered capital, upon approval by the State Council and China Banking Regulatory Commission. Its major partners include government agencies, conglomerates, and renowned international institutions. In response to the government’s policies of promoting energy saving and environment protection, Sinolease has gained solid experiences in providing finance leasing services to projects of solar photovoltaic energy generation, power transmission and transformation equipment as well as energy performance contracting. Mr. Hong LI, CFO of United PV and Mr. Zhongxiao Yao, Chief Operating Officer of Sinolease signed the Agreement on behalf of United PV and Sinolease respectively, witnessed by Mr. Alan LI, Chairman and CEO of United PV; Mr. Jianding CHEN, President of Sinolease and Mr. Lijun YANG, General Manager of Huabei Expressway Co Ltd.